In medium bowl, combine chicken, 1 1/2 cups of the cheese, green chiles, onion and sour cream; mix well. Set aside. Heat grill for indirect cooking as directed by manufacturer. Spray both sides of each tortilla with nonstick cooking spray. Stack tortillas on microwave-safe plate; cover with microwave-safe paper towel. Microwave on HIGH for 30 seconds. Cut 4 (18x12-inch) sheets of heavy-duty foil. Spray foil with nonstick cooking spray. Spread 1/3 cup chicken mixture down center of each warm tortilla; roll up. Place 2 enchiladas, seam side down, on each sheet of sprayed foil. Drizzle each pair of roll-ups with about 1/4 cup enchilada sauce. Wrap each packet securely using double-fold seals, allowing room for heat expansion. When ready to grill, place foil packets, seam side up, on grill for indirect cooking. Cook 10 to 12 minutes or until enchiladas are thoroughly heated. To serve, carefully open packets to allow steam to escape. Place enchiladas on serving plates. Top individual servings with remaining 1/2 cup cheese. Shredded Colby-Monterey Jack cheese can be used in place of the Mexican cheese blend. Thawed frozen South-western-flavored chicken strips can be diced and substituted for the plain diced chicken. To reduce the fat in this dish by about 18 grams, use nonfat sour cream and reduced-fat Cheddar cheese. 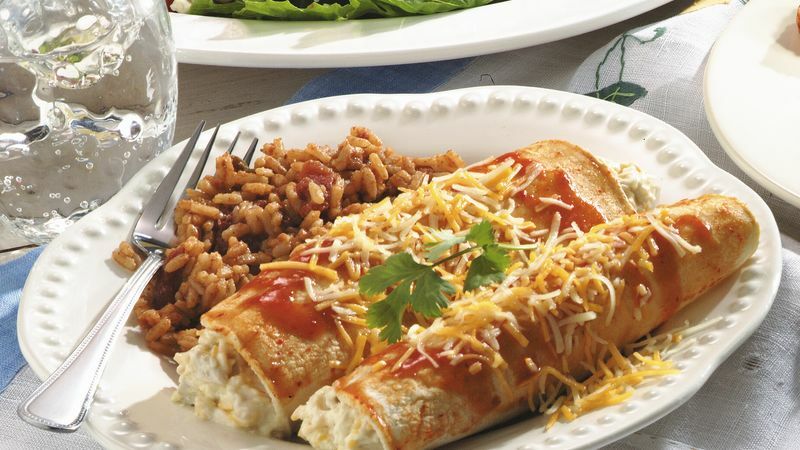 Dress up these enchiladas with diced tomato, sliced ripe olives and chopped cilantro. Spanish rice from a can is an easy accompaniment.